Android Nougat has been released and it comes with a lot of goodies and behind the hood improvements. Two of the notable improvements that we can immediately use are the split-screen mode and the quick switch feature. These productivity hacks will save you a bit of time and trouble when using your phone. To use Split-screen: Long press on the menu button when an app is running. To use Quick Switch: Double tap the menu button when there are background apps running. The menu button is the one that you have been using to bring the list of your recent apps. 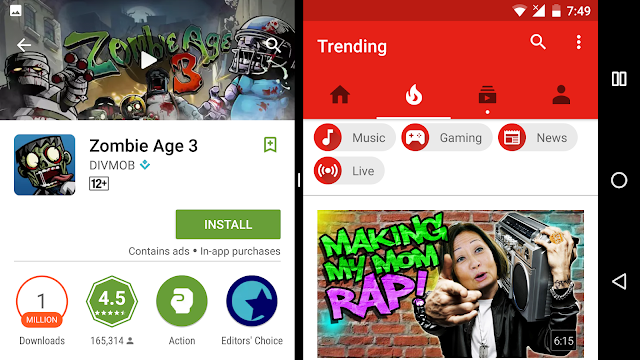 Split screen is a new and highly requested feature in Android devices. If your device is lucky enough to get the upgrade or if your phone comes with it, then you can use two apps at the same time. They share the screen (Top/bottom or Left/Right) and you can change how much real estate each application gets. Using this feature, you can take notes in your Google Keep while looking at your Google Chrome browser. To turn on split screen: Long press the menu or the options button when any application is open. You will see the icon changing from a square to two rectangles (like the square has been divided into two). The app that you were currently using will be forced towards the top half or the left side of the screen. The new space created will list your recent apps which you can switch into. You can drag the splitter or the line in the middle to change the ratio of the screen that each application gets. Once the split screen feature is activated, it stays on. When you go back to your home and open up new apps, you will see how it will be assigned a space on the bottom or right. Your last app seems to get the top or space in the left. To turn off the split screen feature: You can long press on the menu button when two apps are open and when you are not in your home screen. You can also drag the splitting line to the extreme left, right, top or bottom to quit the split screen mode. Quick switch is simple to use but really comes in handy. Just double tap the options or menu button (the square one). You will notice that the currently active application is minimized and the last one is brought up on the screen. For example: You were using the Play Store and then you opened up Google Chrome. If you double tap on the menu button, the Play Store comes back again. If you do it on the home screen, then it brings the app that you used before going back to the main screen. It is really quick and is capable of saving us some time. When the split screen feature is on, if you double tap on the options menu and try to use the quick switch feature, the app on the bottom or right will switch to the most recent one.